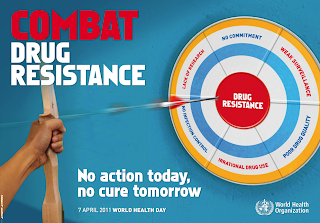 Antimicrobial resistance: no action today, no cure tomorrow. Antimicrobials treat infectious diseases. Drug resistance threatens the effectiveness of medication and treatment methods used around the world. Nations have made great strides in the fight against HIV/AIDS, tuberculosis and malaria, yet the misuse of antimicrobials have produced mutant strands of diseases; thus increasing health care costs, global suffering, and unfortunately, higher death rates. With the on-going global economic issues and lack of philanthropy and/or government funding, many nations also have seen a resurgence of diseases previously erradicated or under control. Reduce the transmission of infection in your household and community. Like Mama taught you when you were young, ALWAYS WASH YOUR HANDS! Use warm water and soap (not hand sanitizer), and for at least 25 seconds (or the length of the "happy birthday" song). Practice food hygiene; wash fruits and vegetables, wash your hands after touching meat, fish, eggs and do not eat moldy food. Reduce the transmission of infection in your community by disinfecting your exercise space/machines at the gym. Last, but not least, sneeze into your arm/elbow area, and not onto your hands!! Get your immunizations in order, especially meningitis if you are a resident of a college dorm. Follow your doctor's instructions when taking antimicrobials. When in doubt, don't be afraid to get a second doctor's opinion. consideration of potential resistance to human drugs before injecting them into food-producing animals. However, that costs money, which affects the bottom line, and you know how companies feel about their profits and bottom line! WHO also makes this recommendation which is interesting: Ensure that only antimicrobials meeting international standards of quality, safety and efficacy are granted marketing authorization. In countries with limited financial resources for research and development, perhaps the quality and efficacy of antimicrobials are compromised with lack of quality control. People can't get the medicine they need and rely on bootlegged medicine that may cause more harm than good. On the other hand, in countries with financial wealth, perhaps profit takes precedence over consumer safety (WHO strategy regarding pharma promotions: Identify and eliminate economic incentives that encourage inappropriate antimicrobial use). People may consume too many antimicrobials, thus increasing drug resistance. This forces the pharmaceutical company to research and develop a stronger antimicrobial, further perpetuating the cycle. As every country has varying standards on quality, safety and efficacy, it's difficult for the consumer to decide what types of antimicrobials to use. In this case, it's best to err on the side of caution and get a second doctor's opinion if you are prescribed an unknown antimicrobial to treat an infection. Or, research if the drug is used in Germany or Holland, as they are known to be countries with the strictest drug regulations. You can also support pharmaceutical companies who support World Health Organization inspections. After all, if they have nothing to hide, they should be fairly open, no? Have a great day, everyone! Enjoy your blessings and the people around you.